I just signed on a few days ago, thanks. Which section of the forum are you trying to edit in? Could you post a screen capture such as the one below. 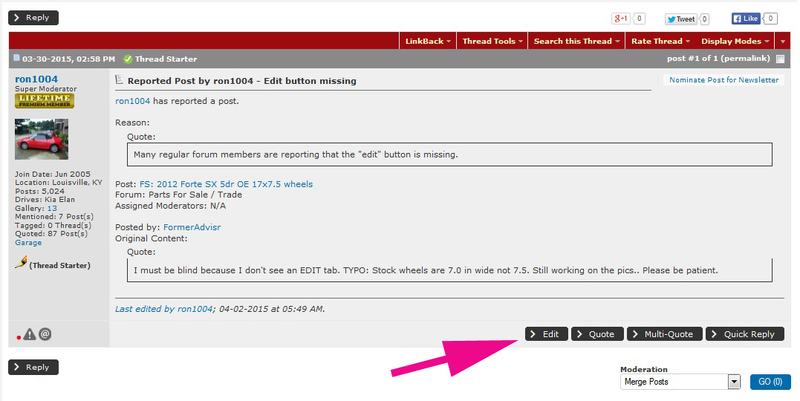 I was trying to cleanup a couple of my posts in the Sorento 16+ forum. While searching for help I saw some references to some Edit tabs and/or pennants but I didn't have them either. Yesterday morning I was enabled to editing my posts, don't think it was anything I did except a couple whines about it. Just all of a sudden "You may edit your posts. Can I have the ability to edit my posts too? Apparently, I can with Tapatalk. Those edit buttons weren't there a moment ago on the Web. Last edited by thesavo; 05-08-2015 at 08:46 PM. Which forum section are you trying to edit in? You'r account permissions looks correct so you should be able to edit. Hi. New member here. No "Edit" button. Maybe I need 10+ posts to get editing privileges? Welcome to a fellow New Yorker(not from the big apple)! I would say you get to call BINGO about your question, need a certain amount of posts! When your account is automatically upgraded in a few posts, you will have the ability to edit.